Spanning 500 years of Brazilian history, Her Mother's Mother's Mother and Her Daughters chronicles a family of women, beginning in 1500 with the birth of Inai , daughter of a Tupiniquim warrior, and ending in 2001 with Inai 's distant descendent, Maria Flor. 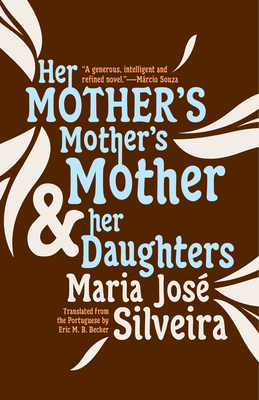 As each new daughter takes the place of her mother, and the mothers before her, Maria Jos Silveira's captivating, cinematic prose takes us through the formation of the country itself, as well as through the roles, customs, challenges, and intrigues of the women within it. It's a delicate subject, the family story is complicated, and not everything was wine and roses. There was, of course, much happiness and love, many battles and accomplishments, great feats--after all, the women here helped to build this country from nearly nothing. But there were also stories of insanity, or murderesses, and not a few sorrows and tragedies. Great disappointments. A good many of them. Maria Jos Silveira is the author of ten novels, including the prize-winning Her Mother's Mother's Mother and Her Daughters, the film rights to which were sold to TV Globo.